Ireland, with its rich heritage and culture, is an important destination on the globe. The Irish people, with their Celtic ancestry, and deep-rooted religious beliefs and superstitions, have spread all over the western world. 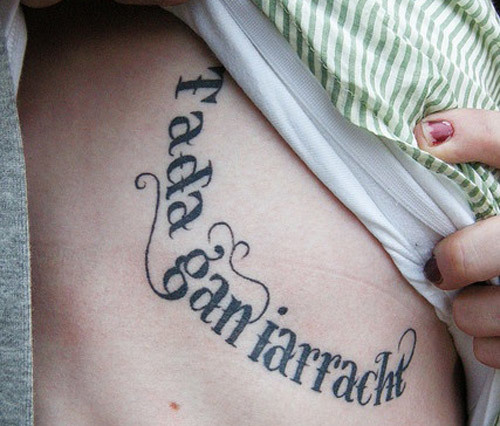 The Irish have had a vast impact on literature and art, including tattoo art for decades now. 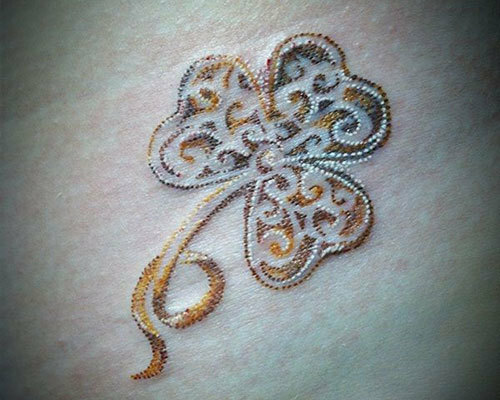 Good luck charms such as the shamrock, Celtic tribal motifs, religious symbols and the Gaelic language are all major Irish contributions to tattoo art. 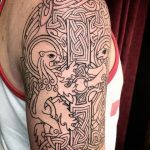 These top ten Irish tattoos are your chance to indulge in the goodness of body art with an inspiring and aesthetic influence. For the Irish people, the clover or shamrock holds much significance as it signifies the Christian Trinity and is the national emblem of this Catholic country. The Irish people also hold on to the belief that the shamrock brings about good fortune. This vibrant tattoo apparently aims to bring with it its fair share of good luck. 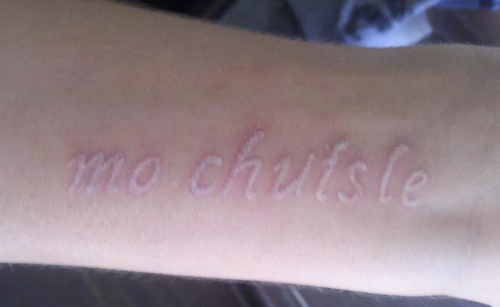 This tattoo simply says “Mo Chuisle” which is the Irish phrase for common terms of endearment such as “My love” or “My darling”. Have this tattoo inked onto your skin to remind you of that special someone whom you hold close to your heart. “Fada Gan Iarracht” is an Irish phrase that simply means nothing can be achieved without effort. Let this tattoo inspire you to face life’s challenges head on and work hard towards achieving your goals. This tattoo is apparently aesthetic and inspiring. When two popular facets of tattoo art come together, it is an explosion of brilliance, and this tattoo is just that. 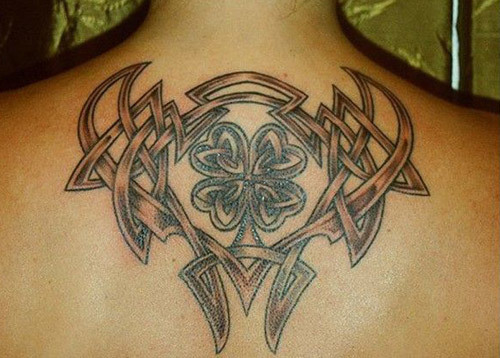 This tattoo depicts an Irish shamrock with apparent tribal embellishments that effectively accentuate this piece of art. 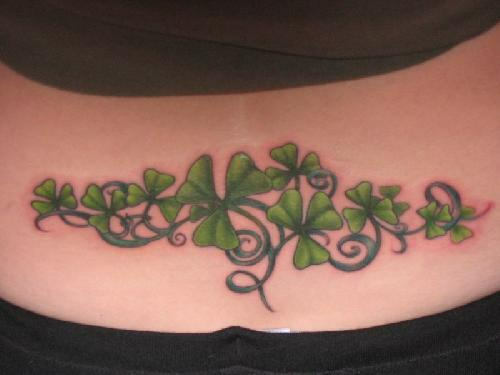 This aesthetic shamrock tattoo is sure to bring about its fair share of good fortune too. 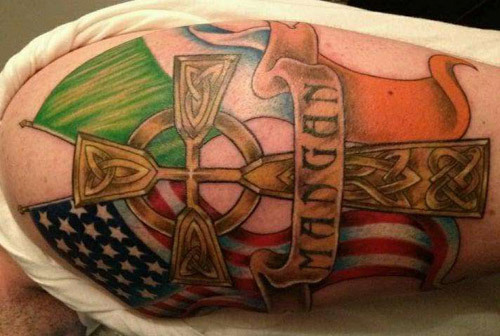 This tattoo is an apparent tribute to the people of Irish descent who have called America their home for decades now. This tattoo perfectly integrates the Irish and the American flag as a sign of solidarity between these two great countries. “Mangan” is an Anglicized version of the Irish surname, O Mongain. The butterfly has much symbolic significance for the Celtic people of Ireland. 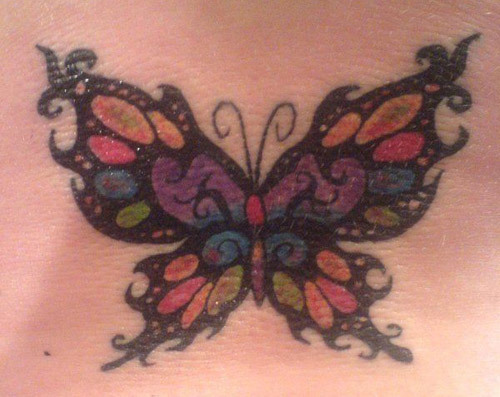 The butterfly symbolizes freedom, beauty and rejuvenation. 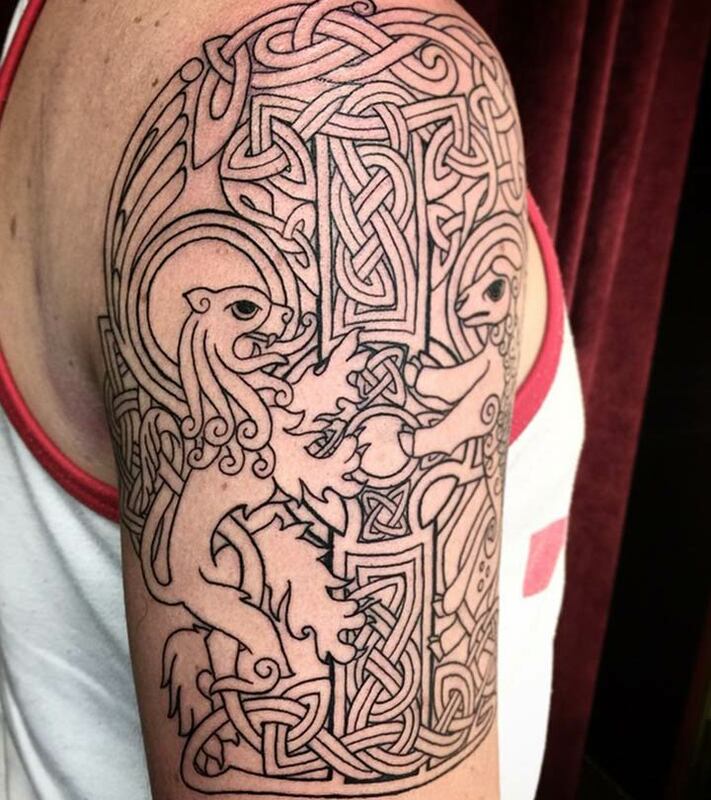 Hence, it is a popular motif in Irish tattoo art. This Celtic butterfly tattoo is inspiring as well as aesthetic. You can never have too much of good luck; hence, you can never have too many shamrocks. This tattoo apparently stands by the theory of – the more, the merrier. This tattoo, depicting a scattering of shamrocks on the upper body, is both aesthetic and a harbinger of good fortune. The Celtic cross is a popular motif in Irish tattoo art and is symbolic of the strong foundation of Christianity in Irish culture. 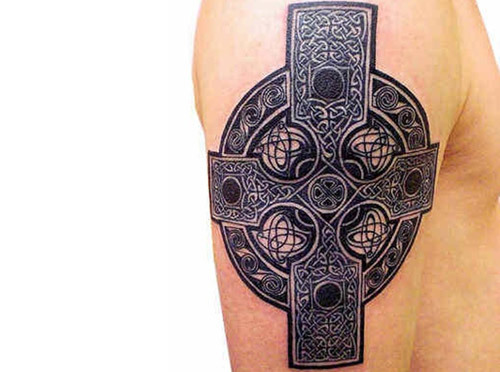 Apart from its religious significance, the Celtic cross is widely used in tattoo art for its aesthetic appeal and as a sign of Irish identity. Skulls are popular in tattoo art across the world and this tattoo is a brilliant example of that. 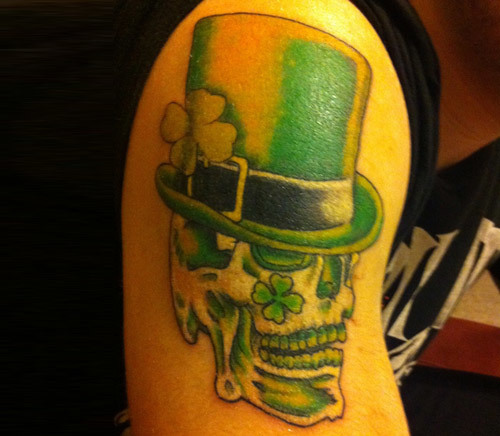 This skull tattoo, with the Irish color green and its fair share of shamrocks, is a fitting tribute to the Irish people. 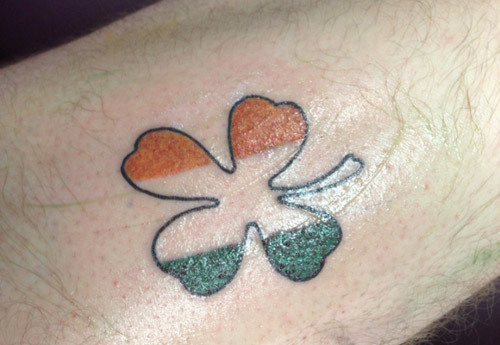 This tattoo effectively depicts a shamrock inked with the vibrant colors of the Irish flag. This tattoo is a fitting tribute to the great country of Ireland. The shamrock is sure to bring you good luck and positivity. Hope you liked these tattoo designs. 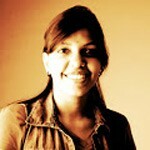 We shall be back with more! Ink your passion with a tattoo that will not be regretted. Find interesting tattoo designs to shape your idea well.